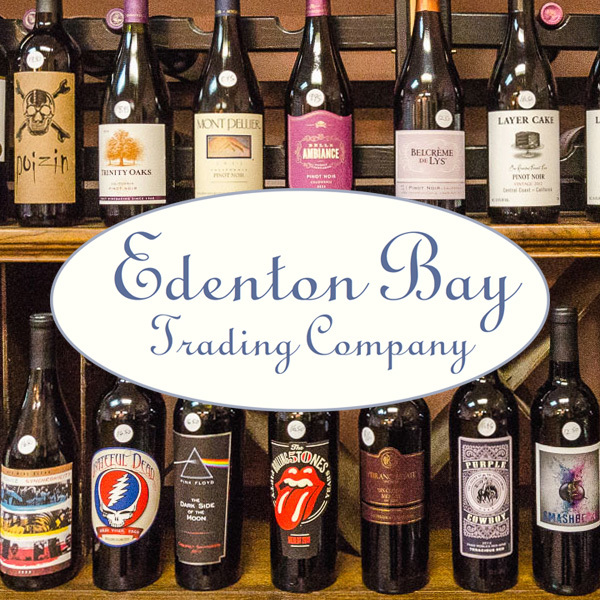 Mon - Thurs 10 a.m. - 7 p.m. | Fri 10 a.m. - 9 p.m. | Sat 10 a.m. - 10 p.m. | Sun 12 p.m. - 5 p.m.
Edenton Bay Trading Company provides a one of a kind shopping experience in historic downtown Edenton. Stop in and explore an eclectic variety of gifts, antique tableware, jewelry, toiletries and perfumes. Additionally, we offer a wide selection of craft beer and wine. Our courtyard is our best kept secret and is a favorite for both locals and visitors alike. Located just out back, it's an intimate and relaxing setting, featuring a koi pond and hand-painted murals. It's the perfect spot to enjoy your favorite beverage from the shop! An eclectic variety of items throughout several rooms. Feel free to sit and enjoy our lush and serene "secret" courtyard patio; specialty wine and beer are also available.